French bond spreads (to bunds) continue to grind higher. 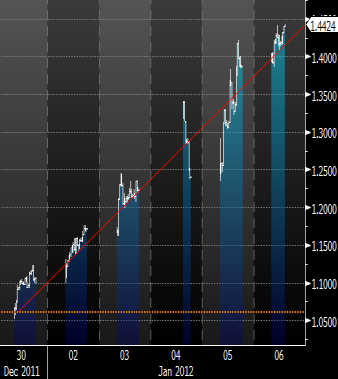 The widening has been almost linear for the past 6 days. Driving this widening have been the ongoing bond auctions, a nerve-wracking experience not just for the "periphery" nations but for France as well. Businessweek: Formerly routine affairs, European government bond auctions have become tense ordeals during the crisis. Countries that cannot raise money at reasonable rates at such sales must be rescued with bailout packages, and investors have grown concerned in recent months that even countries in the so-called European "core" could join that ignominious club. So far, only the relatively small economies of Greece, Ireland and Portugal have sought bailouts. At the very least, if countries like France are forced to pay more to borrow money, they may become less willing -- or able -- to support their smaller neighbors. 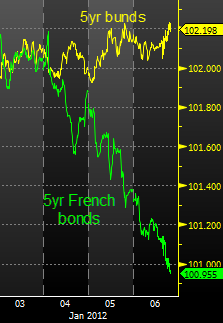 Another way to look at this recent trend is to simply overlay the French and the German bond price movements on top of one another to see the divergence. In addition the whole concept of the French debt downgrade has become almost a cliche, as downgrade chatter continues in the financial media and the blogosphere. It weighs heavily on market sentiment. Businessweek: France's bonds are under particular pressure because ratings agencies have threatened to lower its credit rating. Such ratings are one measure of risk, and investors demand higher returns -- in the case of bonds, higher yields -- for riskier investments. The rating agencies should just get on with it in order to remove this lingering uncertainty from the market place.